Acqua Atla 4 presented in the historic Norla Dome at Melbourne's Mission to Seafarers comprised fourteen cast resin mooring rings, 750 metres of rope, 400 litres of recycled ship engine oil, mirrors, five hand crafted measuring poles, enamel paint, aluminium leaf, two found chairs, a suite of five watercolours and a moving image work in exploring concepts related with natural fields of force and personal safety. How might a thread of moments be like the space of a river? The Acqua Alta projects of Andrew Hazewinkel unfold with the logic of a traverse through a multi-layered terrain, a landscape with it’s own distinctive metaphorical, aesthetic, historical and conceptual features. 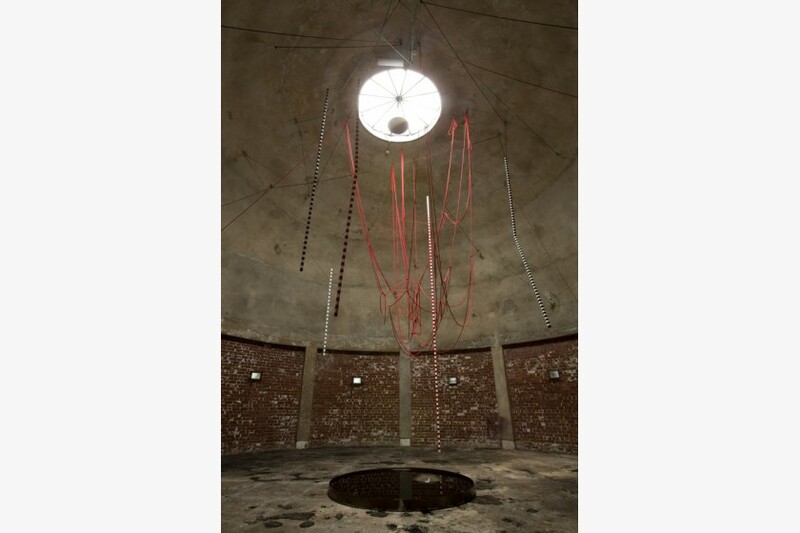 Each work an installation of ropes and cast fibreglass anchors or holds, often presented together with found objects, photographs, sculptural works, drawings or films. 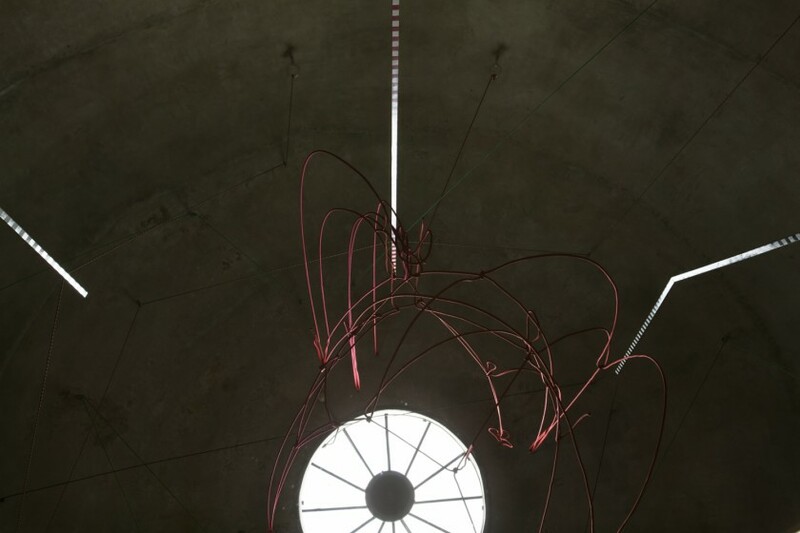 Our attention is always drawn to the flow of our own movements through space and time, this dynamic passage becoming a metaphor for the many other movements running through the works. 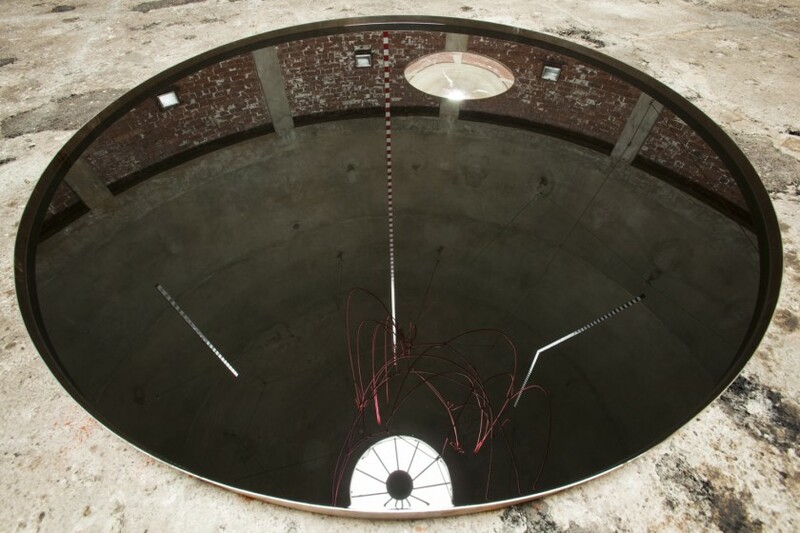 Together, the Aqua Alta projects elaborate a number of definitional tensions, creating a flow of meaning between apparent polarities: provisional and monumental architectures; symbolic markers of both the celebratory and the elegiac; liquid and solid, the clean and unclean, spaces of nature and culture. Acqua Alta #1 2006, took place at the British School at Rome. Two of the four pairs of columns ornamenting the neo-classical façade were bound with a figure eight pattern of rope, a pair of circles, a symbol of infinity, and a path into the interior. Travelling through the foyer and on into a stairwell, the work entered the sub-terrain, or lower level of the school. 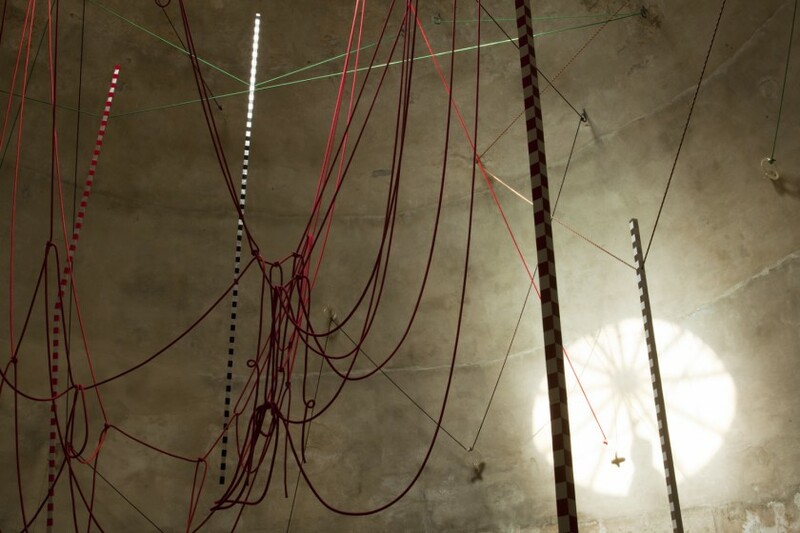 Here the rope criss-crossed the space, threaded through a series of transparent fibreglass wall rings or anchors, glowing in the overhead light. Suspended upside-down from the ropes was a chair. Like flotsam and jetsam tumbling on a flooded river, the upended chair evokes a liquid quality, as if, in a parallel reality, air might be water. There is a strong sense of movement, alongside a counter-tension of claustrophobia and stasis. The world is upside down here, what was once functional is now an ornament in a web, a sculptural form with an absurd pathos. As if following Ariadne’s thread in reverse, viewers were then asked to journey down the stairs, and along a further corridor within the bowels of the building. 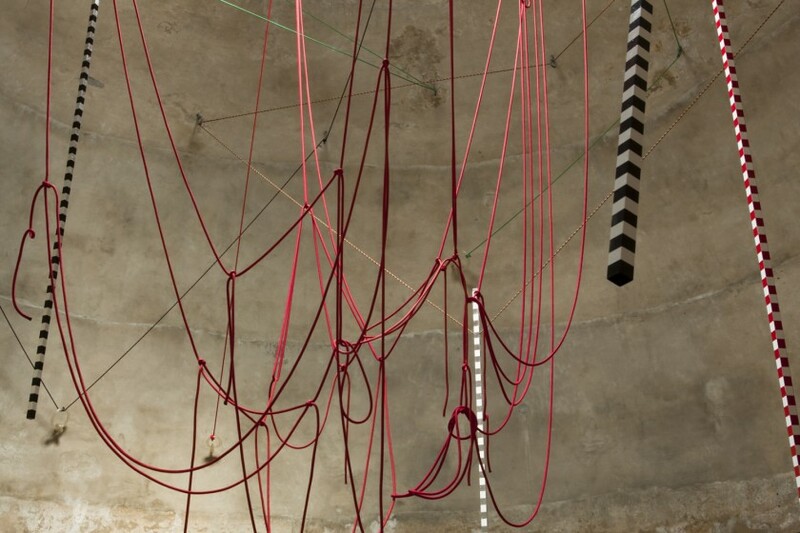 A rhythm was established in the space, with the sway and repetition of each arched line of rope. Whilst web-like, this garland trail of brightly woven cord was also celebratory. A similar palette of bright primary colours was threaded through Hazewinkel’s photographs at the end of the corridor Domus-sub/merge 2006. Here we encounter the tents and bright plastic bags housing the belongings of those living under the bridges along the Tiber River. Each of these photographs of contemporary Rome were paired by Hazewinkel with an image from the Ashby, Bulwer and Mackey Collections, within the archives of the British School, black and white prints of the Tiber in flood, swirling around the distinctive bridges and monuments of the city, images of that which has persisted through time, alongside more fragile and transitional habitations. 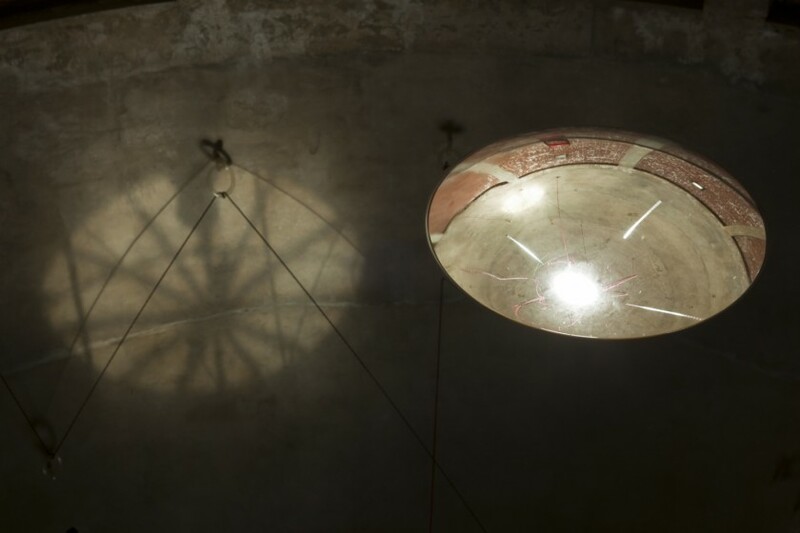 The next evolution of the Acqua Alta project further developed the connection to home. The artist’s own home was the site of Acqua Alta #2 2008. Visitors first encountered a web of chocolate brown rope in the entry stairwell, spanning the brick walls and rising angles of stairs. Again the transparent anchors were employed. Tethering points, fixing the dynamic movement of the rope, a necessary signal of stability. Celebrating the need to fix. If clichés are anything to go by, then Rome is the Eternal City by virtue of its architecture. From the ancient relics of the Forum to the monumental Pantheon, from the cupola of St Peter’s to other Renaissance and Baroque wonders, and out further still to the suburbs and estates teeming with contemporary living, the narratives of Rome unfurl centrifugally through the city, the longevity of its history captured in the immutable authority of bricks and stone. For the great poet and cineaste provocateur Pier Paolo Pasolini, however, this was entirely the wrong way to approach the forces of history. It was not the city’s walls and lintels that put us in touch with long distant pasts, he believed, for architecture was but a mute marker within time, refusing to divulge the events that it had seen. For him, history was not something contained within permanent structures, but released through much more ephemeral events: through fleeting gestures and colloquial speech, for instance, passed down from one generation to the next like waves of embodied memory; or through the particular rhythms of dialects that, as sound and tempo rather than language, have resisted their incarceration as objects of knowledge or static marks on a page. At first glance, this Pasolinian discourse may seem remarkably distant from the work of Andrew Hazewinkel, especially given his long-held interest in water that would surely douse the lucciole’s light. This would, however, be a deceptive first glance, for it is precisely the fragile, the precarious, the survival of all things fleeting, and the historical roots of these survivals that have been Hazewinkel’s persistent subject in recent years. In particular, it is the pulsation of history along Rome’s River Tiber that has snared Hazewinkel’s attention, for if Rome’s architecture is its make-up, then its more profound and murky memory lies within the Tiber. There’s an exquisite little drawing that sits in the Queen’s Collection in Windsor Castle. As Andrew Hazewinkel researched Leonardo da Vinci’s drawings of deluges and studies of water whilst based in Rome, he came across a reference to this small and little known 16th century drawing. After circuitous introductions and lengthy correspondence, Hazewinkel had the opportunity to spend a brief couple of hours with the drawing in London. It’s a tiny drawing, not even 12 cm square, and as all works in the Royal Collection are denoted, it is stamped in the bottom right-hand corner with the ER and crown. Possibly a political allegory, or allegory of Fortune, the work itself is done in ink, now faded to a dried-blood sepia tone. The drawing also bears the markings of other experiments in line, with dark charcoal-like smudging which may be part of the cloudburst drawing, or, as with so many of the drawings of this time, may be unrelated jottings made in haste on the nearest page to hand. There is text all over the page, both front and verso, in what appears to be Leonardo’s characteristic reverse mirror-writing in an old Italian dialect. O mjseria umana, ‘oh human misery’, spiders in reversed text across the base of the page: an ambiguity that leaves a contemporary viewer unsure whether this is a calamity we have bought upon ourselves. On a more prosaic note, the text on the rear appears to be six lines detailing Leonardo’s household expenses. Leonardo’s drawing depicts a form of deluge, a cloud-burst of God-like proportion, where every-day objects appear to cascade from the sky. Though centuries old, the image has parallels to more recent footage of disasters from our natural world captured during the devastation of recent tsunamis and local floods, whilst the ominous cloud clusters appear not dissimilar to contemporary photographs of the great rolling cloudscapes of ash from the Icelandic volcano. The scene has an extraordinary contemporaneity with many of the objects cascading from above indistinguishable from the detritus of our own modern times. They have a familiarity and an every-day quality of the stuff that clutters our 21st century lives. The rain of material possessions described in the catalogue includes ‘rakes, bills, bagpipes, barrels, clocks, ladders, pincers and spectacles.’ I make out forms that could be aerosol cans; a small plastic looking rake; rubber rings that tangle with hooks and the legs of upturned stools; and tubing, cylinders and dome-like forms, which in more contemporary times clog our landfill and litter our shores. The seeming contemporaenity of the subject may have attracted Hazewinkel to this small drawing. For many years, and many European sojourns, he has captured footage of rivers in flood, gathered archival photographs of familiar locations made unfamiliar by the deluge, and documented the accidental installations and every-day accidents that appear as the water recedes. Whilst the specific locations are less important than the flotsam and jetsam that eddies and swirls or the patterning and marking that appear in the mud, I cannot help be fascinated by familiar locations made unfamiliar by extraordinary events. Rome’s Pantheon half-submerged in the Tiber’s excess; or furniture floating by as rivers burst their banks – the domestic made unfamiliar through its watery change. There is a stillness to these photographs, and silence from the absence of people and human form, which is belied by the raging fury of the video footage however much it is slowed down. Nature unleashed has the ability to make even the most ubiquitous item of 21st living, the plastic bag, an object of beauty and – albeit ambiguous – wonder.